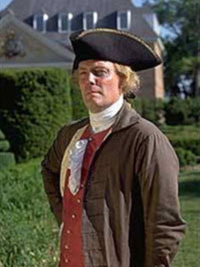 My name is Bill Barker and I have the privilege of portraying Thomas Jefferson for Colonial Williamsburg, and for such other organizations as Mr. Jefferson's services might be required. First, let me acknowledge my deep gratitude to Colonial Williamsburg for the opportunity provided to me of sharing my love of history and my appreciation for the accomplishments of Thomas Jefferson with so many people. This site will only be a small look at some of the many wonderful insights that Mr. Jefferson's life, time and achievements can offer us. It is my fervent hope that you too may be inspired by the man and his times as I am. For a further discussion of what Thomas Jefferson can offer us today, please check out the answers I gave in this interview. Email me directly at Bill@thethomasjefferson.com.